Clinton is a small community of less than 1,000 people on Whidbey Island, Washington. Whidbey Island is located in the Puget Sound off the coast of Everett and northwest of Seattle. It is part of Island County, which includes Whidbey and Camano Islands, and Naval Air Station Whidbey Island. The ferry to Mukilteo, Washington, is located here in Clinton. Larger communities nearby include Langley, Freeland, Coupeville, and Oak Harbor. Clinton is known for its coastline and relaxing vacation environment; Whidbey Island is a popular tourist destination for people and families who want to whale watch, fish, kayak, or explore the scenery of the islands. 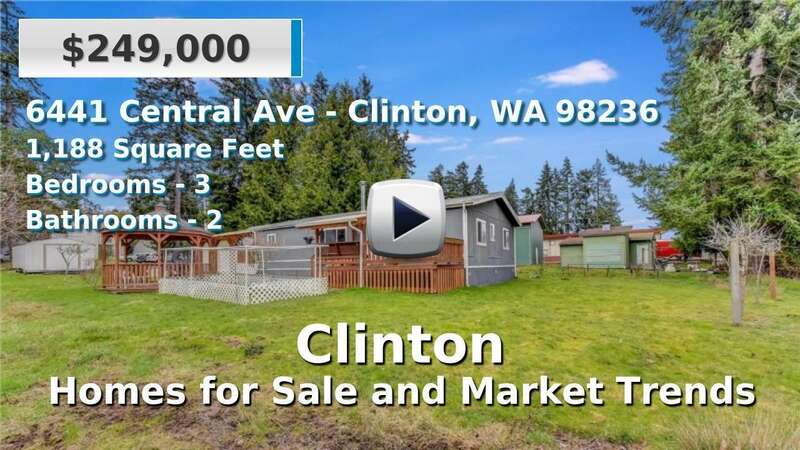 Homes for sale in Clinton are older than the county average but enjoy small town surroundings, spectacular views and an island atmosphere. 2 Beds | 1.75 Baths | 1557 sq. Ft.
3 Beds | 3 Baths | 2128 sq. Ft.
3 Beds | 3.25 Baths | 2572 sq. Ft.
3 Beds | 2.5 Baths | 2951 sq. Ft.
2 Beds | 2.75 Baths | 1604 sq. Ft.
4 Beds | 2.25 Baths | 3114 sq. Ft.
4 Beds | 1.75 Baths | 1982 sq. Ft.
2 Beds | 0.75 Baths | 504 sq. Ft.
2 Beds | 0.75 Baths | 1112 sq. Ft.
3 Beds | 3 Baths | 2368 sq. Ft.
3 Beds | 3.5 Baths | 4807 sq. Ft.